Their importance cannot be ignored owing to their civilisational links. Rivers are the life of this very nation. Bharat has essentially grown along the banks of its major rivers. The great civilisations like Mohenjo-Daro and Harappa were born along rivers, and they died in the course of meandering of the rivers. We owe our very own existence to our rivers. Rivers in India, like the Ganges, have strong presence within the Indian ethos and civilisation and are considered the backbone of activity. From ancient days, the people who lived alongside riverbanks believe the river to be sacred and holy, and many go on pilgrimage to cities like Varanasi and Allahabad to wash away their sins in the holy water. It is this vitality of the Ganges that makes it one of the most powerful epicentres of spirituality which continues to draw millions of people to visit and understand its culture and history. The agro-ecological stretch of the Ganges provides food for most parts of this nation. Many great civilisations took shape on the banks of these holy rivers. Early river-valley civilisations include the Indus Valley Civilisation, Ancient Egypt (the Nile), Mesopotamia (along the Tigris and Euphrates rivers), and the Chinese civilisation along the Yellow River. Most of these civilisations are agrarian societies. However, one of the major challenges confronting rivers today is climate change and the situation is alarming. Today our rivers are depleting at such a rate that they will become seasonal in 20 years. In the last 10 to 12 years, we have witnessed a dozen rivers going dry across the nation. Today, some of the most significant rivers of south India, the waters of the Cauvery, Krishna and Godavari flow to the oceans only for a few months in a year. Recently concluded research on ‘Impacts of climate change on Indian rivers’ by professor AK Gosain of IIT Delhi has also observed that the majority of river systems show an increase in precipitation at the basin level. This is not only true for big basins such as the Ganga, but also for smaller basins such as the Cauvery, Pennar, Luni, and Indus. It was also observed under climate scenario for 2021–2050, MC, that there is a general increase in flow dependability for many river systems such as the Indus, Ganga, Brahmaputra, Tapi, Godavari, Narmada, Mahanadi, etc., whereas under long-term (2071–2098, EC) studies suggests that parts of Krishna, Cauvery, Brahmaputra and Ganga show a decrease in flow. The same study also goes on to reveal that under different greenhouse gas (GHG) scenarios, the conditions may deteriorate, and this can be in terms of severity of drought in some parts of the country while they may enhance the intensity of floods in the other. However, it acknowledges the fact that there is a general overall reduction in the quantity of the available run-off under the present GHG scenario. Luni, along with rivers of Kutch and Saurashtra, which occupy 25 per cent of the area of Gujarat and 60 per cent of the area of Rajasthan, shall also face acute water scarcity conditions. The report further predicts that the river basins of Mahi, Pennar, Sabarmati and Tapi shall also face water shortage conditions along with the river basins of Cauvery, Ganga, Narmada and Krishna facing seasonal or regular water-stressed conditions. On the other hand, river basins of Godavari, Brahmani and Mahanadi are predicted to face severe flood conditions. The importance of rivers cannot be ignored owing to their civilisational links. The significance of the river was first noticed in the Rig Veda, which considered the river Saraswati, one of the lost rivers in India, to be the mother of the seven seas. There are 45 hymns in which the Rig Veda eulogises it. Even the Ramayana refers to it as Ikshumati, that is, Brahma’s daughter. The Mahabharata too has references to the holy river. But the story does not end here: there is strong archaeological evidence that apart from the Indus, the Sarasvati was also the lifeline of the Indus Valley Civilisation, thus prompting many scholars to call it the Indus-Sarasvati Civilisation. Renowned archaeologist Michel Danino of IIT Gandhinagar has also referred to it in his book The Lost River: On the trail of Saraswati. Not only this, the Indus Valley Civilisation was also mapped by British archaeologists about 200 years ago and was believed to be located on the dry beds of Ghaggar Hakra. One of the early explorers of ancient civilisations, Colonel James Tod goes back in time to trace the reasons for the depopulation of the northern desert and credits it to the absorption of Caggar (sic) river. Almost 200 years ago, a French scholar named Vivien de Saint-Martin, too, had argued that all the streams that flow from the west to the east, namely Ghaggar, Markanda, Dangri, Sarsuti and Chautang unite into a single bed and that is the bed of Rig Ved’s Sarasvati. Apart from French, a Hungarian-British archaeologist Marc Aurel Stein too referred to Ghaggar as the eastern most tributary of Sarsuti, a corruption of Sarasvati. Travelling forth from ancient to modern scholars, they too believe Ghaggar is a strong contender for the mythical Sarasvati. Science too supports their belief, as satellite images of the region show that Ghaggar, in other words Sarasvati, had its significance not only during the Vedic times but also during the Harappan age. An examination of 1,400 Harappan sites shows that almost 75 per cent of these were along the Ghaggar-Hakra channel. It is the civilisational, cultural, spiritual and geographical importance of these rivers that made them the lifeline of our ancient civilisations and the lifelines of modern society as well. Even today, 80 per cent of our population is dependent on 14 major rivers for food and livelihood. More than 400 million people live along the banks of the Ganges alone, and thus depend on it for their subsistence. An estimated 20,00,000 people take a dip in the Ganges, on a daily basis. Yet, the society is disconnected from the environmental importance of these rivers. 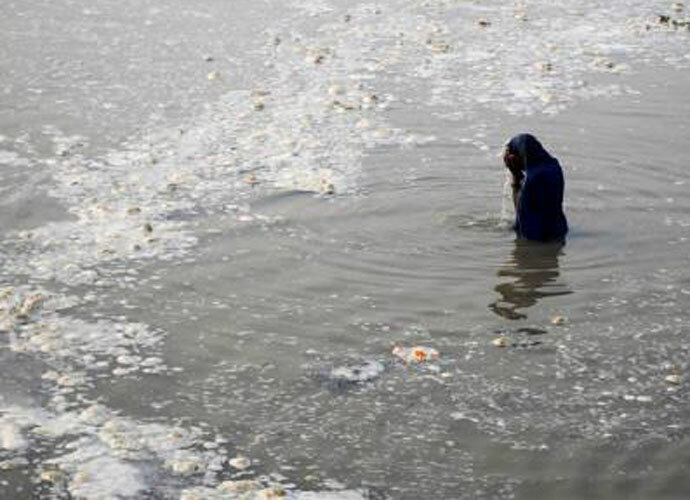 More than 200 million litres of untreated human sewage flows into the Ganges from Varanasi alone. There is an alarming disconnect among the youth today, as they seem to be disconnected with this civilisational and natural heritage. The uninterrupted flow of these water bodies is being taken for granted and thus, the society is nearing its end. The society today fails to realise that threats to our rivers will lead to major challenges to food security and finally to the very existence of our civilisation. It is this disconnect that has to be bridged, to be able to pass on the gift of this great heritage to the generations to come. The author is a senior research fellow at India Foundation and author of 'Bharat Sutra'.